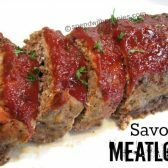 Delicious Savory Meatloaf with a zing! Spray a foil lined pan very well with no-stick spray. Place the meat on the pan and form into a loaf shape about 4" wide x 3" high.